The team from the German capital defended surprisingly well during the first half. Nevertheless, Thomas Tuchel’s newly shaped Borussia Dortmund team seem unstoppable at the moment, even though a set piece was the key to break the Berlin Wall. Hertha’s Hungarian head coach Pál Dárdai throw any attacking purpose into disarray, as he fielded Fabian Lustenberger as fifth defender between the centre-backs John Anthony Brooks and Sebastian Langkamp. Moreover, the defensively minded Johannes van den Bergh played as left-winger, with Genki Haraguchi being the lone striker up front. In defence, it looked like a proper 5-4-1 shape, while in ball possession it was something between a 4-1-4-1 and a 3-3-2-2. Meanwhile, Thomas Tuchel trusted what seems to be his first-choice eleven at the moment, with Pierre-Emerick Aubameyang playing as centre-forward again. Alongside İlkay Gündoğan in centre midfield, the 19-year-old Julian Weigl was once again in Tuchel’s confidence. As of late, Dortmund’s attacking structure has featured quick crossovers from the deep right half-space to the left side as well as an intended overloading of the left wing. Against Hertha, that concept, however, did not work out in the first thirty minutes. Since the Berlin team had two horizontally compact lines and the chain mechanisms worked flawlessly, Dortmund were not able to generate the necessary speed when playing the ball through the number six’s space. Therefore, the Schwarzgelben were asked to move the ball even more quickly from one side to the other. Particularly Ginter seemed to be a target for diagonal balls, as the right-back was positioned high up the pitch, when Dortmund were building-up – but to no effect during the early phase of the game. Hertha’s approach was simple at first glance. While building up, Lustenberger usually advanced and was positioned as a number six, while Per Skjelbred moved through the half-space and Vladimír Darida became Hertha’s number ten. The player-to-player distances in the first two lines were relatively high, though. On the other side, Dárdai asked his players to overload the space around Dortmund’s back four, what was clearly a strategy to receive long balls and to play lay-offs, while bypassing the midfield zones more easily. As already mentioned, Hertha usually defended in a rigid 5-4-1 shape with some man-orientated adjustments. For instance, Van den Bergh often stood a bit wider, when the ball was on the right side, because he intended to watch Gündoğan in the half-space. An intriguing procedure to watch was how Hertha handled the transition from a 5-1-3-1 middle (midfield) press, as Skjelbred was positioned behind Darida and the line of three tried to cover the passing lanes and higher half-spaces respectively, to a 5-4-1 deep press that, for instance, compacted the gaps between the defenders in the back five. The precision of this transition, coupled with a great group tactical protection in terms of chain shifting, came unexpectedly. 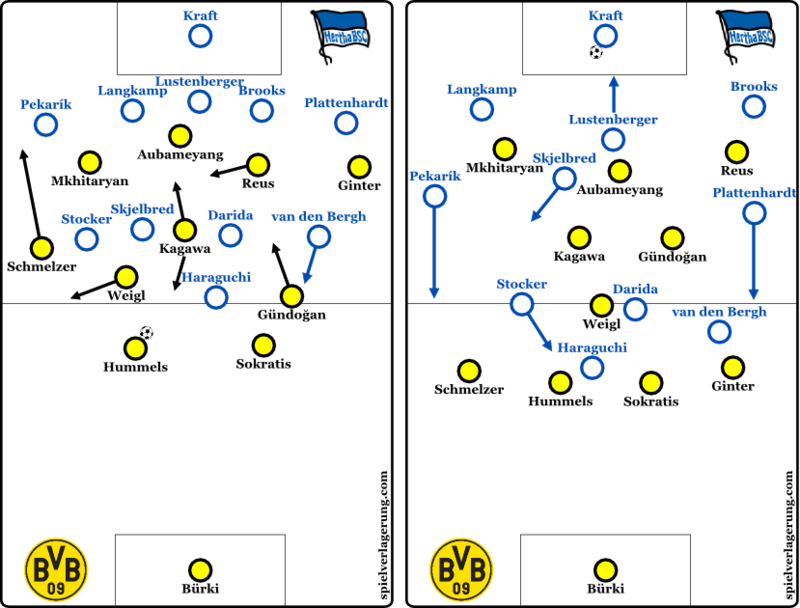 Therefore, Dortmund initially struggled to break Hertha’s wall and pass the ball between the lines. Only Kagawa showed his incredible touch when he received a few balls in the pockets, but had no connection to his teammates afterwards. Moreover, the usual overloading of the left side seemed to be ineffective, because Hertha always had two players out wide to block the passing lanes and to cover cut-backs by using coverage shadows. 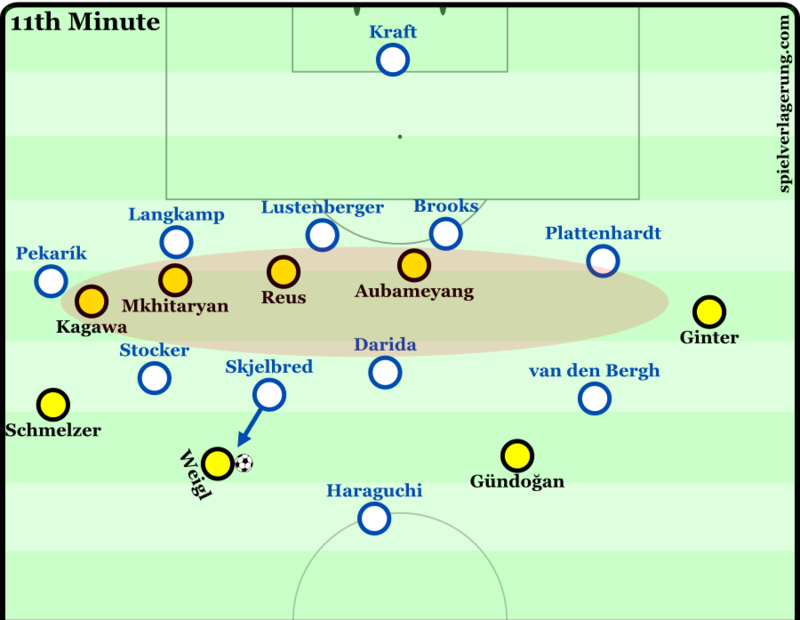 After the first ten minutes, Dortmund slightly changed their approach, when the likes of Shinji Kagawa and Marco Reus more frequently penetrated the space between Hertha’s lines. By the way, the latter once again interpreted his role flexibly. Reus left the right side on many occasions, as Matthias Ginter was positioned at the side-line. At the extreme, Reus, Kagawa, and Henrikh Mkhitaryan all together appeared in the left half-space, when Mats Hummels or Julian Weigl, who tended to drift to the deep left zones, pushed forward, while carrying the ball. 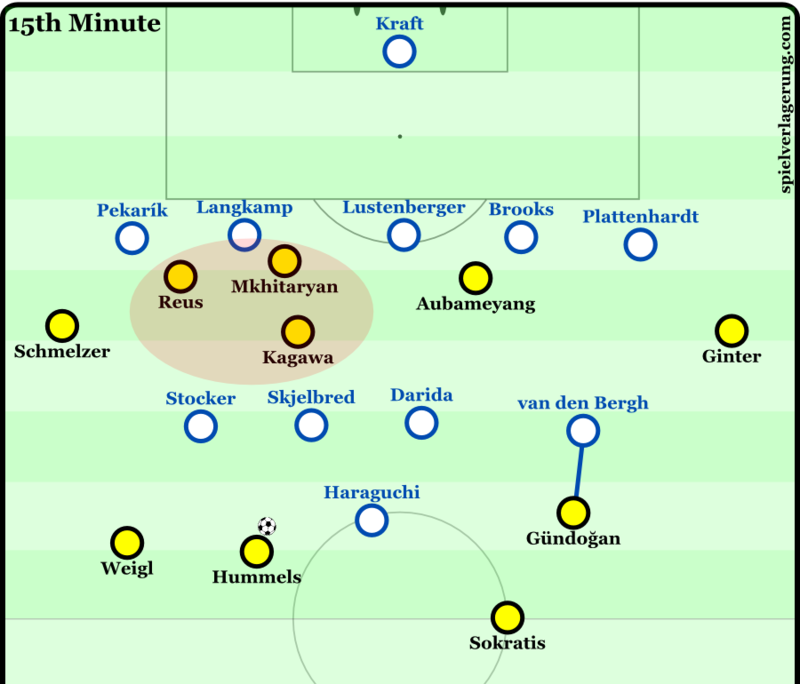 However, Hertha did not stray from their intended path, maintaining the short distances horizontally and vertically, so that the best chance of the opening quarter-hour saw a long ball over the top of Dortmund’s centre back, while Haraguchi ran onto that pass. But Hummels had enough time to catch up and clear the danger. Dortmund needed a short corner to break the deadlock. 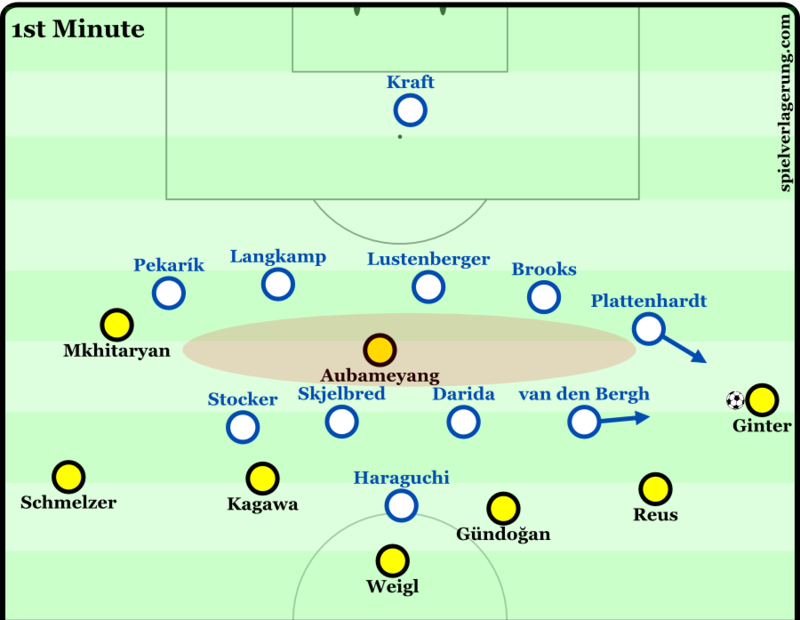 Shinji Kagawa was allowed to cross a ball towards the back post, where Hummels, marked by Langkamp, had the advantage in the air duel and bagged a goal. At the end of the first half, WhoScored stats showed a Dortmund with almost sixty percent ball possession and passing accuracy of eighty-six percent. Moreover, it displayed that Aubameyang was mostly isolated until the interval, with only six touches during forty-five minutes. Tuchel adjusted Dortmund’s approach, as he moved Aubameyang to the right side, while accommodating Reus centrally. In what was a false nine role, the 26-year-old roamed fluidly at the top of a diamond-like midfield structure. Meanwhile, Dárdai delivered Stocker, who had only seven touches, from a painful matchday. The newly signed Mitchell Weiser replaced the Swiss winger, but the general approach remained unaffected. However, Hertha’s captain Lustenberger did seemingly not get the message. He oddly pushed up a few yards and left a hole in the middle of Hertha’s back line. Apparently, Lustenberger wanted to pressure Mkhitaryan (or Reus) in a man-orientated manner, but it was not adapted for the rest of the defence. It was Kagawa, who then delivered another diagonal lobbed ball to the far post, with Ginter using his wide position for the first time effectively, when he squared the ball accurately for Aubameyang. After fifty-eight minutes, Dárdai replaced Skjelbred with Alexander Baumjohann and changed the formation to a 4-4-2. 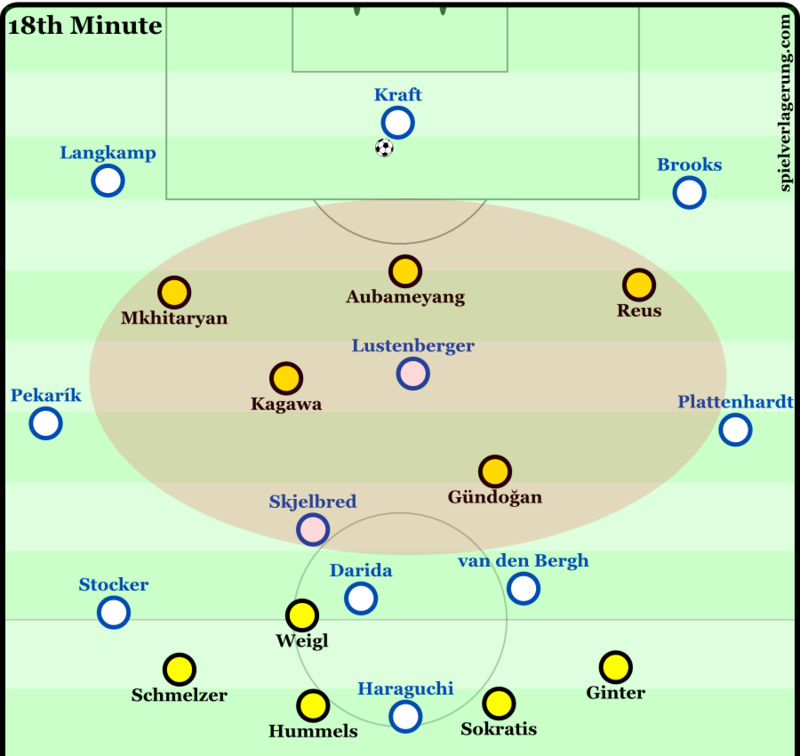 Subsequently, Hertha had the first longer spell of ball possession, but Dortmund were still in total control. The home team, however, did not get the job done, as they missed a couple of great goal-scoring opportunities, with Reus, Kagawa, and Mkhitaryan all having bad touches when standing in front of Thomas Kraft. Many home supporters had premonition of what was to come. Hertha played through left-back Marvin Plattenhardt, who then was in double coverage, as right-winger Jonas Hofmann, substituted shortly before, joined Matthias Ginter at the corner of the box. Plattenhardt was able to pass the ball back, and afterwards the ball was played diagonally into the penalty area. Baumjohann layed the ball off to Darida who instantly hit a low shot that was parried by Roman Bürki outwards to the feet of Salomon Kalou, who converted the first Bundesliga goal conceded by Dortmund this season. Although BVB continued to waste chances, they managed to grab a third goal in injury time with former Berlin forward Adrián Ramos sealing the deal to take Tuchel’s team ahead of Bayern Munich at the top of the standings. Once again, Borussia Dortmund displayed why Tuchel’s Juego de Posición-esque approach seems to prove to be successful. 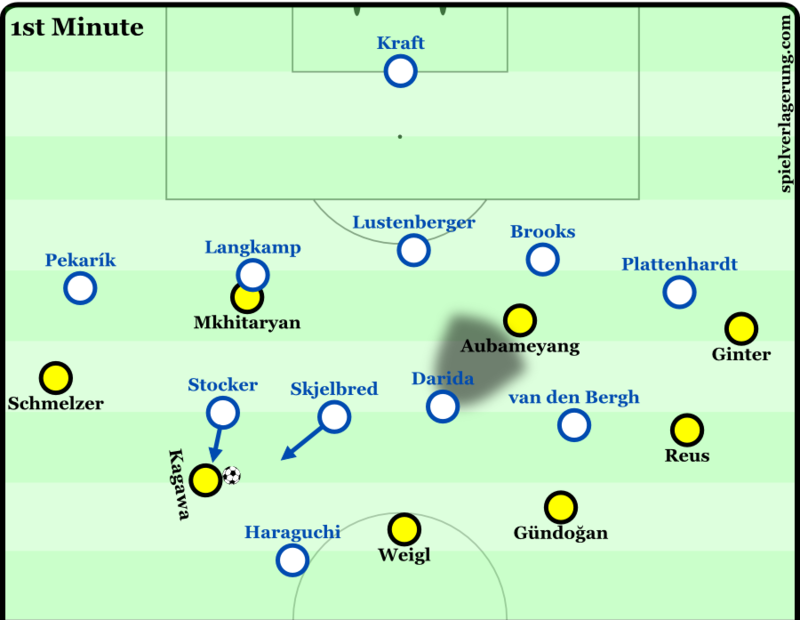 However, the Schwarzgelben needed a short corner to take the lead, because Hertha unexpectedly knew how to stay compactly and how to move the lines ball-orientated as well as space-orientated, so that Dortmund could not generate the necessary collective quickness to move the ball fast enough to the left side, while overloading the half-space. Nevertheless, BVB came up victorious, despite wasting many chances during the second half, when Hertha were not able to maintain their well-ordered structure. Thank you for the analysis. However, I felt that you did not really explain the effects of Tuchel’s Second Half change, where He put Reus in the false nine role and Aubameyang moving more to the right. It would be nice if you could also have provided a diagram for it and explained whether it made any changes to Dortmund’s play.